We had a steaming return to SJSS on July 6th to join David Wordsworth as part of the Americana ’18 Festival. For a programme packed with gems by American composers we were joined by countertenor soloist (and former member of Tenebrae!) David Allsopp for Bernstein’s Chichester Psalms, percussionist Barnaby Archer, harpist Sally Pryce from Aurora Orchestra and the extraordinary James Sherlock on organ. James surpassed himself on this occasion as the organ at St John’s was having serious problems with the heat at that time – remember the heat wave? The manuals were buckling in the middle owing to the expansion of all the keys and so it was almost impossible to play any single note without the key becoming stuck. Somehow James managed to find enough stops to cover all the notes we needed but without playing right in the middle of any of the manuals. The brain power, let alone the nerve and the calm, to pull this off was fairly mind blowing. Together with David’s solo and James’ trickery we enjoyed an ecstatic performance that was at times wild in its enthusiasm from the singers. Much else to mention in this programme though and another vocal highlight from our brilliant mezzo soprano Martha McLorinan, giving us a spine tingling rendition of the solo in Copland’s In the Beginning. Other beauties from the likes of Stephen Paulus, Eric Whitacre and an older name Randall Thompson made up the programme… oh and I nearly forgot, we finished with Schoenberg’s Friede auf Erden! Next up a concert in Winchester Cathedral. I’ve been to so many of England’s great Cathedrals that I rarely think I’ve missed anything too significant but quickly realised my error when we got to the Nave of this stunning building. I felt we were spoiled by the acoustic. Despite the impressive length of the Nave our sound pinged around the Cathedral with bell-like clarity. In such huge venues our basses sometimes have to put in a shift and a half but Winchester was surprisingly giving and supportive. Can’t wait to take the choir back to sing there again! Another little gem among our English treasures is the Cathedral in Hereford. Here I was hit by a wave of nostalgia as I recalled singing daily evensongs when I was a boy chorister. 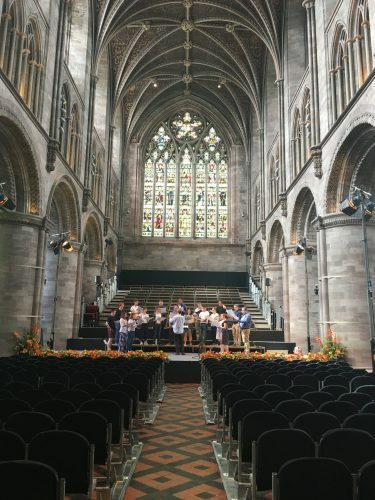 Each summer holiday my church choir would up sticks and take up residence in one of our local Midland Cathedrals for a week to enjoy making music in these glorious places. 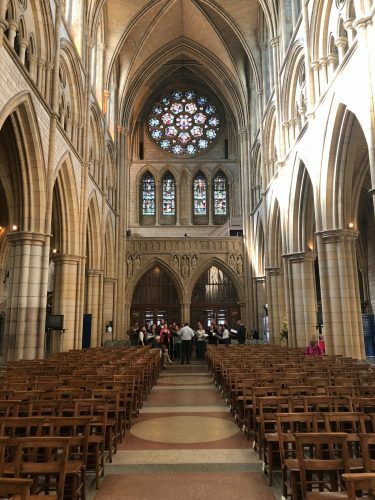 It was also a glimpse into how it must feel for many of our finest Cathedral and collegiate chapel choirs to be making music and leading worship on a daily basis. Anyway, I digress. Our WWI commemorative programme ‘We Will Remember Them’ went about as well as it possibly could have and was enjoyed by a huge and very attentive audience – and a pigeon who was clearly a music lover as whenever we stopped singing he started flying about the Nave! In the summer we were privileged I felt to have the chance to perform in some truly glorious venues and also possibly the hottest venue I’ve ever performed in. 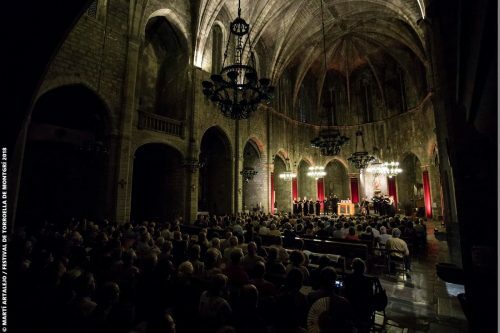 Torroella, near Barcelona, was in the middle of that heatwave I mentioned and we sang in a church with just the one window and no ventilation. Even by the end of the rehearsal we realised it was going to be a testing atmosphere. The concert went incredibly well however and I felt we had a very sympathetic audience very much on our side. There is a picture of one of our tenors after the concert and it’s worth seeing to get an idea of just what a sauna we found ourselves in. Then off to Germany for 3 concerts. 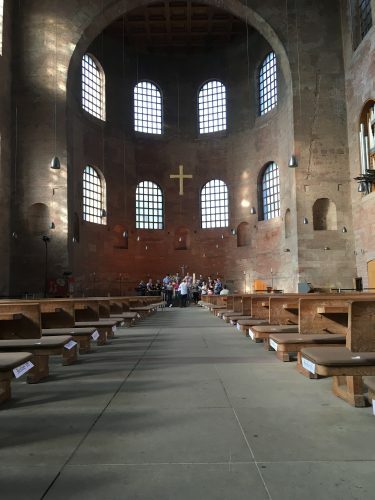 The acoustic in Bremen’s St. Petri Dom is amazing in that no matter where we stood, all of us or just a quartet, the sound rang around the building making everything crystal clear for all of the 3 packed audiences we had. Yes, 3! We repeated a 40 minute programme 3 times as the Cathedral was hosting the first day of the City Festival and there were tens of thousands of people spread all over the old town centre. Three full performances of the Allegri was no mean feat but Emilia Morton and Emma Walshe did a wonderful job soaring up to those high c’s again and again, and again! Then there was the awe inspiring church in Trier built in 310AD. A vast barn of a building that it’s difficult to believe is so old. The scale of this church had jaws on the floor and the concert felt like a privilege for us to give. The best of the lot however was saved until the end. An amazing nineteenth century neo-gothic church in the middle of Stuttgart, Johanneskirche am Feuersee. I enjoy all of our concerts but the choir for this one were on sensational form and rose to the challenge of performing a major work in the German choral repertoire to a German audience – the Schoenberg. 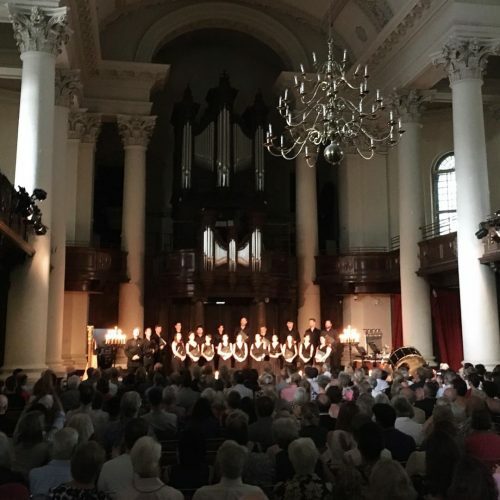 A dear old friend of mine and formerly the manager of the King’s Singers in German speaking territories in Europe was a guest for the concert and said afterwards “to hear the choir was… I cannot say a pleasure, it was much more, it was a shattering and moving experience”. ‘We nailed it’ is I think the expression. One or two very fine German beers were consumed afterwards. Once into September it feels like things will begin to get back to normal after all the lovely breaks and holidays of the summer and so it turns out, no sooner were we back at school with our kids than I was off again to Italy with Tenebrae. A beautiful town called Merano and yet another beautiful church with a glorious acoustic. It makes such a difference when we turn up and realise that our venue is going to help all the music we sing by reverberating and ringing around all these ancient walls and stones. Next a jaunt down to the South West of England to two more of England’s magical Cathedrals. Exeter’s is a beautiful building and it was a treat to wander about a little during the concert to discover so many different things there. At the end of the concert we gave the audience a World Premiere: Holy is the true light by our Associate Artist Bass Owain Park. As befits the theme and mood of our programme Owain has written a little gem based a line of plainsong melody from the Requiem Mass ‘Lux aeterna luceat eis’. With a serious nod to Joby Talbot’s Path of Miracles, after a searing climax in the music, and singers break off into small groups dispersing to the far corners of the Cathedral until out of sight. Bravo Owain. It’s one we’ll sing all over the world I suspect. Also worth mentioning that I worked again with the terrific chamber choir of Exeter University and their director Michael Graham. They’re an extremely impressive outfit and it was great to see them at the concert and enjoy some downtime afterwards with them. So often we don’t get to spend any time with our audiences because there’s always the time pressures of getting on to the next concert or, even more importantly, getting everyone home! Finishing everything off was a trip even further west to Truro. This is one of my favourite cities and cathedrals in the whole of the UK. Everything just seems to be perfect. I know the singers feel this is always a very special place to perform in too. I took some time out to go to a Eucharist and hear the Cathedral choir and their director Chris Gray, and of course it was no surprise to hear the boys making their usual glorious sound. I always manage to pile on a few extra pounds when I spend time in Truro as I can’t resist some of the traditional local delights: a cream tea, Cornish pasty (or two) and a pint (or two) of the finest Cornish ale, plus after the concert a trip to the Kathmandu Palace to sample some not-so-local cuisine… Roll on next year’s visit I say, perhaps after I’ve had the chance to go on a diet.